Last years big banks LIBOR rigging mega-fraud is so old news, for this year has seen the mainstream press and now the FCA regulator finally wake up to an even larger mega -fraud that of rigging the £3+ trillion daily forex markets which will prompt Britain's regulator to today fine several members of Britain's banking crime syndicate for their part in the fixing of forex market exchange rates in London that allowed the banks to profit at their clients expense. Today's fines will only amount to a mere pittance when compared to the magnitude of the fraud committed, but worse the exercise will amount to purely a smoke and mirrors exercise for the fundamental fact that bank customers and tax payers ultimately FOOT the bill for ALL of the fines levied on the banks as we have seen countless times during the past 6 years as after each fraud is revealed that illuminates another black hole in the banking sector's balance sheet, so steps forward the UK Treasury and the Bank of England to further funnel unlimited tax payer cash onto the banking crime syndicates balance sheets so as to ensure that they can continue exist to think up new frauds as the bankster's seek to bank bonuses on the basis of fictitious profits, all without ANY consequences! No prison terms for bankster's despite the level of criminality. The mainstream press in the early hours is alluding to 6 banks including Barclays, HSBC and RBS to be collectively be fined £1.5 billion by the UK FCA regulator that will likely also see additional fines levied by other regulators such as the U.S. and Europe, so likely the fines total will be several times that of the UK's £1.5 billion. 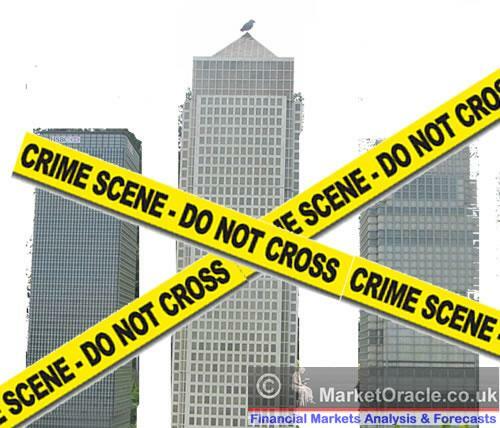 However, the fines will still only amount to just the tip of the ice-berg as I have repeatedly warned during the exposure of each of the banking crime syndicates frauds on its customers such as PPI mis-selling and the LIBOR fraud of 2013, as defrauded customers set in motion legal actions to recover many, many times the amount fined as compensation for losses, a bill that is picked up firstly by tax payers, then ordinary bank customers, share holders of the banking crime syndicates who's value of stock holdings disappear down a black hole and finally everyone as a consequence of the inflation that rampant money printing generates. The fact remains that NOTHING has really changed over the past 6 years for the fundamental reason that the regulators are themselves former bankers, so a revolving door operates between the big banks and regulator. 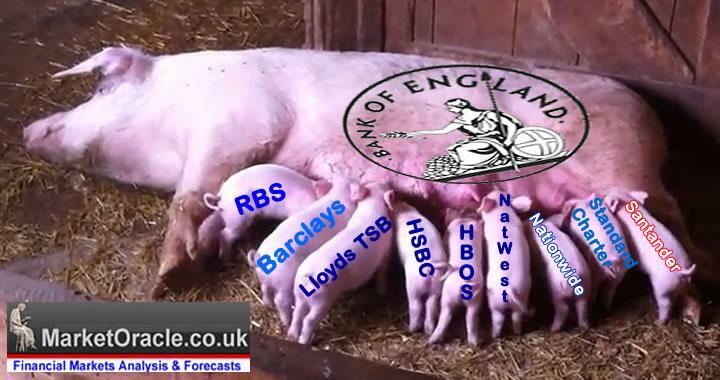 The city regulator and the Bank of England are staffed by former bankster's. This is why the Bank of England's primary unwritten remit is to support its bankster brethren in the continuous process for the transfer of wealth a nation produces by whatever means, be it QE money printing or fractional reserve banking to the bankster elite. For actual justice to be served, then rather than today's smoke and mirrors nonsense, instead there should be NO FINES but rather several hundred bankers should be charged with fraud and held to account in a court of law with ultimately the guilty sentenced to long prison terms. In this respect the Serous Fraud Office (SFO) is investigating but no charges yet. The rich get rich by leveraging themselves to the exponential inflation mega-trend by owning income generating capital assets that 99% of workers (wage slaves) service and will never be able to obtain as a consequence of debt and inflation as they find that the purchasing power of their earnings is constantly being eroded by real inflation that never tends to match the governments inflation indices and by virtue of real inflation most people in a society become vested interests towards political party bribes whom they are expected to vote zombie style at each election to continue to be in receipt of hand outs (printed money) to fill the gap between earnings and inflation, a gap in economic productivity that is continuously being siphoned off by the elite as a consequence of the elite holding most of the income generating assets in society. Thus Inflation + Capital results in an spiral towards which the wage slaves own less and less capital whilst the elite continue to concentrate wealth in their hands. This is why UK house prices have been rising whilst real terms average wages have been falling because the wealth the economy generates is further being concentrated into the hands of the elite who re-invest it into capital assets such as property pushing up prices which further reduces available supply for the wage slaves hence why most people including academic economists just cannot understand how can house prices be rising so strongly when average earnings have been falling. THE WEALTH GENERATED BY THE ECONOMY (wage slaves) IS BEING RE-INVESTED BY THE ELITE INTO CAPITAL ASSETS SUCH AS HOUSING, and this is a reinforcing cycle that ultimately ends when the elite (0.1%) own virtually ALL of the assets (over 90%) resulting in a society that is PRIMED for a REVOLUTION! The only way for individuals to break out of this downward debt spiral is as I have voiced countless times in many articles and several ebook's (FREE DOWNLOAD) is to NOT borrow money and to accumulate income generating assets the most familiar of which to most would be rental properties. The encouragement to load up on debt by various means such as Equity Release is once more being programmed into the psyche of home owners as they perceive this as a means of capitalising on the nominal increase in the value of their homes. In life I meet many people who have no concept of their risk of ruin, but instead are fully aware of for instance the equity in their property. For example one person I met wanted my advice as they were contemplating releasing £100k of equity in their property on top of a £200k existing mortgage so that they could extend their property against a perceived existing property value of approx £350k. What I attempted to point out to the person was their failure to comprehend that the more debt one accumulates then their risk of ruin becomes exponentially greater, because the debt becomes exponentially harder to service out of marginal income, i.e. a graph of debt to income would be logarithmic in terms of the risk of ruin. In this example the first £10k of mortgage debt would have a far smaller risk of ruin then adding an extra £10k to the total i.e. £200k +£10k. Where the extra £10k could be the tipping point that results in the loss of their property, never mind if they went ahead and borrowed an extra £100k! The whole debt crisis in terms of impact on home owners has it's basis in the failure of individuals to be conscious of their risk of ruin as they fell for the equity release sales pitches form the mortgage banks. This is precisely how the big banks blew-up, because they ignored their risk of ruin because they were too interested in hiding losses (mark to market) to bank bonuses on the basis of fictitious profits. Again do not fall for the trap of perceiving the rise in house prices as means of realising capital or equity for consumption because you are just being deluded into SPENDING BORROWED money. Where the delusion is that the borrowers do not perceive it as an INCREASE in debt but instead a release of equity! The TRUTH is that rising house prices in reality do not MAKE people richer, but instead more susceptible to BORROWING MORE Money for CONSUMPTION as people delude themselves that they can somehow spend money against a rise in house prices, but the reality is that they will service the NEW debt through FUTURE WAGES and nothing that is linked to the actual rise in the value of their homes because to benefit from a rise in house prices they would need to realise it by either selling or generating an INCOME from the rise in house prices! i.e. by renting out their home or rooms so that it wholly covers the interest payable on the NEW debt and thus the income would need to be at a constant yield to rising house prices. That is how an home owner benefits from rising house prices and NOT by means of equity release for consumption. If you want to have near zero risk of ruin then you really have to have no debt. However that is just not possible for 1/2 of home owners / buyers which means that you need exert strict discipline in regard to how much debt you are willing to take on that in my opinion should never exceed more than 75% LTV (loan to value). Debt IS from cradle to grave slavery. Not just for individuals but whole nations are turned into debt slaves by corrupt politicians whose ONLY objective is to bribe voters with borrowed money to get elected and then line their pockets. The consequences of bribing voters with borrowed money is INFLATION. After all there is no free lunch, the price paid for printing debt is loss of purchasing power for ALL fiat currencies. 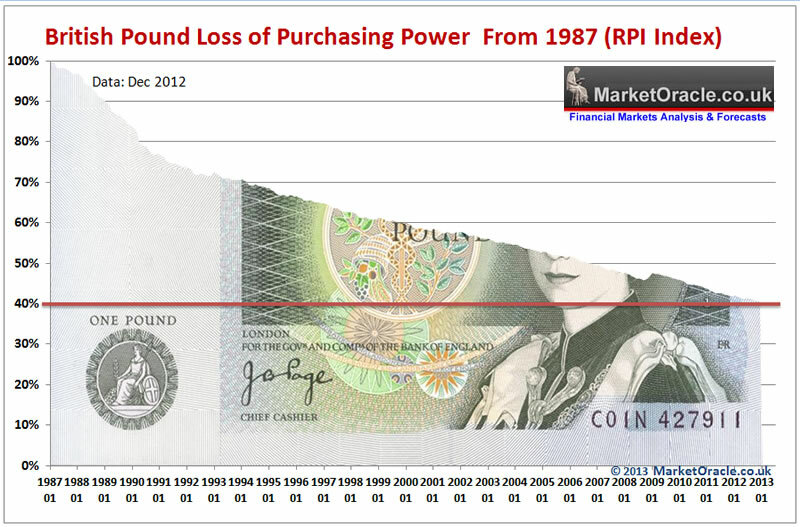 As an example today's pound in your pocket on the basis of RPI is worth less than 40% of its value of 25 years ago. Which means that on average the same types of goods and services cost 2.5X more today then they did in 1988. Today we hear a lot of discussion in the mainstream propaganda media of a currency war. 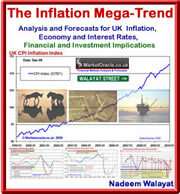 Know this that there IS NO CURRENCY WAR, as I have voiced for well over 5 years now and as illustrated by the Inflation Mega-trend ebook of Jan 2010. If there is a war than it is one of INFLATION and its consequences of stealth theft of purchasing power because ALL CURRENCIES are in a state of perpetual free fall against one another. To limit ones exposure to debt slavery one needs to immunise one self form the Debt based system which is by NOT BORROWING MONEY! This is easier said then done because we are literally bombarded with propaganda from an early age that seeks to brainwash us into becoming debt slaves. Do not use credit cards if you are unable to pay off the whole balance each month. Do no buy anything with debt money, especially junk chinese consumer goods which amount to nothing more than the transfer of Jobs from the West to the East. If you have any assets purchased with debt money then liquidate / sell them and pay down the debt because these assets will likely quickly lose their value over time i.e. such as car. Yes, I fully understand it is difficult to counter cradle to grave brainwashing to become debt slaves, but do the sums and you will see that you will end up spending approx 1/3rd of your working life servicing your debts. You have effectively given away 1/3rd of your working life to the bankster elite. And this is not a casual relationship with your debt master but one of constantly finding yourself anxious if you are unable to meet the strict deadlines for servicing debt repayments that your debt master imposes on you, including making you homeless so to effectively have lost EVERYTHING you have worked hard for your whole life. You only have a limited amount of time, i.e. say 45 years max of productive working life, do you want to give up 15 years of your most productive years in exchange for a garage full of chinese junk? The bottom line is that if you cannot afford to buy it from earnings or savings then don't buy it! The reason why debt slavery is so seductive is because if offers instant gratification, flat screen tv, car, house in a near instance, because we all have at the back of our minds that our Time on Earth is LIMITED, we only have a short lease on life and so our natural state is highly conducive towards becoming debt slaves. Debt slavery is another manifestation of the theft of our future, it is nothing new just the latest device to steal ones life because for eons humans have been successfully conditioned to give up control over their lives on the basis of ancient myths being utilised to make promises of how you will only really beginning to live AFTER they die in exchange for your PRESENT LIFE. Debt slavery - Sell your future for an instant gratification in the present. Religious slavery - Sell your future because you will only really begin to live after you die. Instead, as I have written in countless articles (see archive) the answer is to focus on the PRESENT. For it is ones actions in the present that determine the future. The solution is not to BORROW MONEY! I fully understand that is is very, very difficult for people who have been brainwashed to be able to consider this, but I assure you, not handing over approx 1/3rd of your earnings towards the elite's debt servicing will result in a far more prosperous and stress free life and all you need to do to overcome your programming is exert some self confidence in respect of the tendency towards instant gratification because usually working towards a goal is far more rewarding than actually achieving the goal and the worst thing people can do is to achieve goals without work, which is a recipe for personal disaster which is what debt slavery entails. Labour, Liberal, Conservative, or SNP it does not matter they are ALL party to the debt slavery system that they operate from local councils right through to national governments. So the likes of the SNP propagandising the Scottish Referendum as a freedom movement is a red herring, as there is no freedom for the Scottish people but a means for the Scottish Bankster's and Elite to be able to implement more locally targeted mechanism to enslave the Scottish people by means of debt. What the people of Britain need is an alternative system to the debt and tax slavery system that funnels wealth to the bankster elite, the starting point for such a system would have ZERO taxation and NO debt industry, which means that the unproductive bloated public sectors would not exist and the governments would not have the means to bribe voters with nor would the banking elite have the means of conjuring money out of thin air which they lend to debt slaves to work to service their whole lives, otherwise your children and grand children will continue to born into a debt and tax based slavery system. In our society the worst place for ordinary people to be is in debt, for you risk ruining the rest of your lives as being in debt either by design or chance (parking fines etc) can soon spiral out of control. Therefore people need mechanisms to first avoid getting into debt and then the consequences of official charges, penalties and fees from spiraling out of control. The bottom line is that one needs to work hard to achieve and maintain ones freedom in today's western debt based societies where the young adults are exposed to intense propaganda aimed at turning them into life-long debt slaves such as via the Universities which for approx 75% of students are in my opinion a SCAM because they will still end up flipping burgers or stacking shelves, only after the scamming universities have fleeced them out of approaching £50,000. In my opinion virtually all of us have been successfully brainwashed / conditioned to become slaves of the elite by means debt slavery, the primary mechanism for control preys on our natural instinct for a secure shelter / home that we can only achieve by means of saddling ourselves up with a mountain of debt. Our current system of housing market debt slavery is by design for if successive governments had favoured independence and freedom then they would not have sold off 60% of the social housing stock. As mentioned earlier governments inflate house prices to give the illusion of an increase in wealth which encourages more debt funded consumption against the rise in house prices and perceived increase in wealth. All of this despite the simple fact that house price inflation ONLY benefits the wealthy. For instance ordinary people buy a house for say £150k, it inflates in price by say 25%, thus ordinary people feel £37.5k richer which encourages debt fuelled consumption against this rise in house prices. But are people really £37.5k richer ? Do the maths, now what is the value of your next target home ? What was it £250k, But that will also have gone by about 25% (probably more) so it will now be priced at £312.5k or have increased by £62.5k against your property which will have increased by £37.5k this leaving you £25k WORSE OFF than if house prices had NOT risen and there in lies the beauty of the house price inflation scam, for the masses have been successfully conditioned by the media / system to see house price inflation as being great ! But in reality it only really benefits the elite who's £1 million+ mansions are LEVERAGED to average house prices, for instance a £2million home would have increased by say 50% in price to now stand at £4 million, so whilst you have gained £25k the elite has gained £2 million ! Proportionately the elite has made 80X what you have made and thus putting you exponentially further away from where the elite was before i.e. your £150k property was 7.5% of the elites mansion but now your £187.5k mansion is only 4.7% of what the elites property is worth therefore in effect house price inflation acts as one of the primary mechanisms for the transfer of wealth from the workers to the elite. Off course it is extremely hard for conditioned slaves to break their masters bonds especially given such an ingenious system of house price inflation wealth transfer mechanism. So I am not expect 99% of the people reading this to be able to break these systemic bonds as you will all still desire to partake in the house price inflation debt slavery system no matter what facts are presented to illustrate that at the end of the day only the wealthy win and the more wealthy the person then the greater will be the increase in wealth as the curve is exponential. So I am just letting you know the primary reason for why we have perpetual house prices inflation is so as to enable the elite to own virtually everything in the long run until either there is a revolution or a the government steals from the rich to bribe the poor to vote for them, but even then the elite are a bunch of crafty buggers as they always know a way out so the theft is usually from the middle classes rather than those with real wealth. Today the only people who are free are those who do not work in service of their debt masters because most of us remain convinced that we must borrow money to the maximum extent to be able to buy a house, for that is how we are controlled for the duration of our adult lives, from student debts, to consumption debts to housing debts, to retirement residency debts, for that is how the elite increases its wealth, where not even an economic depression halts the accumulation of wealth amongst the elite, instead the percentage of wages siphoned off by a myriad of methods such as inflation increases, hence the cost of living crisis. In my experience the real secret of financial success is...... continues in the New UK Housing Market Ebook available for FREE DOWNLOAD (only requirement is a valid email address). To facilitate the kind of changes you envisage would it not require a complete re ordering of the monetary system? After all, almost all of the money is introduced into the economy via a debt instrument of some sort. If it is private money then that means of course bank loans of one kind or another, if it is public then it means a government bond. There is a very well known quote by I believe JP Morgan to the effect that all money is debt, without debt there is no money. It would appear then that the monetary system has been developed specifically to enslave us.